Christian Amido, who died from complications of a brain aneurysm, was a soft spoken man who had been under his doctor's care since I had gotten to know him in 2001. Against his doctor's orders, he frequently smoked while pulling samples to taste out of various casks. Ironically, in the past three years, he had completed renovated his chai, installing a new press and replacing his cement tanks with a fleet of stainless steel. His domaine was poised to move onto the next level. Amandine, Christian's granddaughter, and Antoine Berthaud pose outside their domaine in Tavel.Domaine Amido is now run by Christian's daughter Nathalie. 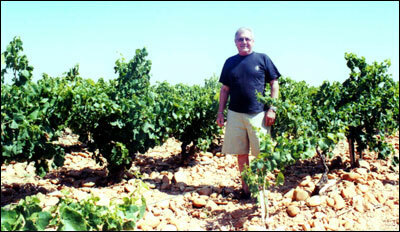 Her son-in-law, Antoine Berthaud, is the winemaker. 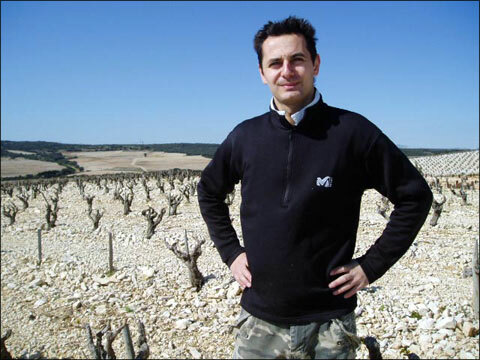 The domaine's Tavel is named for his wife and Christian's granddaughter, Amandine. Les Amandines Tavel comes from a number of different parcels of vineyard totaling 13 ha (32 acres). The soil for the Tavel vines is primarily two different types: galets roulés (red round rocks commonly found in Gigondas, Chateauneuf-du-Pape and many of the Southern Rhône villages), and flat white stones comprised mainly of schist. The exposure of the vineyards is directly south, ensuring that the grapes get plenty of maturity. The harvest is by hand, with sorting taking place in the vineyard. The grapes arrive in the winery and are crushed. This rosé is made through the saignéemethod: The juice remains in contact with the skins for 24-to-36 hours, and is then bled off the skins so that the color remaining is completely natural. Fermentation is at a low temperature to preserve the subtlety and freshness of the aromas. ​Amido's Tavel is made with a blend of 65% Grenache, 20% Cinsault, 10% Syrah and 5% Clairette. It undergoes a macération pelliculaire for 36 hours to extract maximum aromas. Afterwards it is fermented at a low temperature to preserve freshness to its red fruit aromas. It displays excellent value. Tasting Notes: Richly colored rosé with cherry, strawberry and a touch of almond flower flavors. Lots of freshness on the palate, and with enough body to match wonderfully with cold pork roast, chicken salad and most picnic fare. We've been working with Amido since the 1998 vintage, seen the death of the patriarch and the rise of their talented winemaker Antoine Berthaud, husband of the late Christian Amido's granddaughter Amandine (for whom the rose is named). The 2013 Cotes du Rhone Villages, from the village of Signargues (about five miles from Lirac) continues a line that this wine has followed since the 2011 vintage, tons of forward fruit, soft, well-integrated tannin and plenty of up-front drinkability. 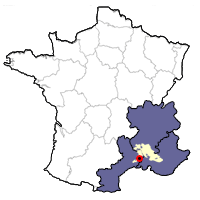 Domaine Amido has just over five hectares of vines in the village of Signargues, about half a dozen kilometers south of Tavel. The soil resembles that of Lirac, with galets roulets and clay, and the vineyards have a southern exposure. The wine is made with 70% Grenache, 20% Syrah and 10% Mourvedre, and aged in tank. It is forward and fruity, yet with and underlying seriousness that helps it to resemble the more expensive Lirac. Domaine Amido also has vines in nearby Lirac just to the north. The clay soil atop the limestone (Lauzes calcaires) contains large pebbles that provide excellent drainage. Their bottling is made from 50-year-old Grenache vines (60%) in addition to Syrah (30%) and Mourvèdre (10%). The Lirac is aged in stainless steel tanks and sees no oak. It is a lovely balanced wine, showing raspberry and cherry notes, along with a touch of tobacco and spice. Once again, superb value! Domaine Amido Lirac Les Mûres 2015: made with 60-year-old Grenache vines (50%) in addition to Mourvedre (30%) and Syrah (20%). The Lirac is aged in stainless steel tanks and sees no oak. Tasting notes: It is a lovely balanced wine, showing raspberry and cherry notes, along with a touch of tobacco and spice. Once again, superb value!